Because the only output from elections is the final count for each race or ballot measure, political scientists have relied on pre-election polling and exit polls to interpret voting behavior. Anyone who studies public opinion knows that some of the most insightful information from the polls comes from crosstabs, looking at the relationship between views and positions. Every pollster and political scientist also knows that polling is rife with errors—although still the best means for understanding public opinion. If, however, we were able to see the relationship between voting options at the individual level from the actual ballots, we would not need to rely so much on the polls. Now we can move beyond the polls. At least in one instance. During the summer of 2017, the Castleton Polling Institute examined the ballots from Rutland City’s 2017 Town Meeting Day election (March 7, 2017), building a database of actual voting behavior (not dependent upon self-reporting from surveys). That database allows us to test the patterns of voting in Rutland, to understand the relationships between support for mayoral candidates and other options, such as the city budget and choices for the Board of Aldermen. Of course, the ballots are absent any identifying data—such as age, party, and gender—but they provide some insight rarely seen or used in political science research. The first insight into the data shows the relationship between one’s vote for mayor and support for the Rutland City budget (Article 2 on the ballot). 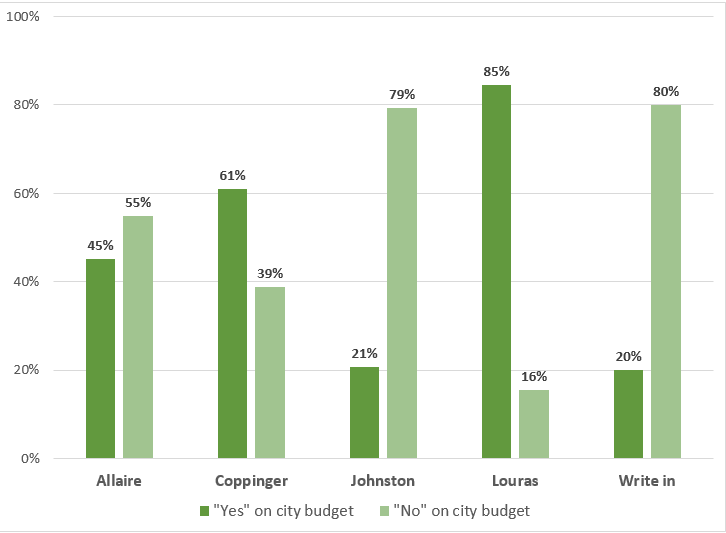 The figure below shows that those who supported the winning candidate, Mayor David Allaire, were far less likely to support the budget than were those who supported either the incumbent, Christopher Louras, or challenger Mike Coppinger. Article 2 on the ballot, which proposed the city budget, easily passed with 57 percent of the vote. However, 55 percent of those who voted for Mayor Allaire voted “No” on the city budget. On the other hand, 85 percent of those voting for Louras, and 61 percent of those voting for Coppinger supported the budget article. Interestingly, but not surprisingly, supporters of Kam Johnston and those who wrote in a different option were even more opposed to the budget than the voters for Allaire. These data suggest that Louras and Coppinger represented the establishment voters, those who approved of the budget put forward by the Board of Alderman and, in the case of Louras voters, also supported the incumbent. Allaire’s support—which amounted to 51 percent of the voters—came from many who rejected the budget; in fact, if it were only up to Allaire’s voters, the budget would have failed. In this light, the 2017 Rutland City election looks like an insurgent election, where the voters rejected a long-time incumbent but could not muster enough support to defeat the proposed budget.